Crystal healing – any info on what blue quartz can be used for? Blue Quartz inspires serenity, meditation, and psychic and spiritual development. Blue Quartz is especially beneficial for those experiencing emotional unrest as it disperses fear and introvert tendencies. Thought to encourage thoughtfulness and consideration, Blue Quartz gives the ability to stimulate relationships by reaching out to others. Blue Quartz is believed create a healthy endocrine system, and provides relief from disorders of the blood, spleen, thymus, lungs, heart and throat. 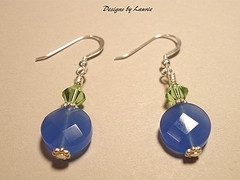 This entry was posted in Crystal Glitz and tagged accessories, blue, crystals, designsbylaurie,, jewelry on July 25, 2009 by admin. 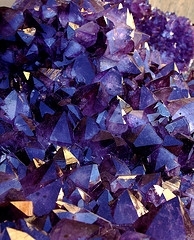 Historically, crystals have always been displayed and used for their beauty and their unexplained energies. In this modern world, we are constantly seeking new ways to use crystals to help heal and restore balance to our ever increasing stressful lives. Crystals are formed naturally in the earth and they undergo extreme temperatures and chemical reactions. Perhaps it is this natural formation that balances energy forces within the environment. To calm mind, body and spirit: Laying flat on the floor, lay a clear quartz point facing up at the top of the head, a rose quartz crystal on the heart and a smoky quartz point at the bottom of the body facing down. Laying in this position will allow the clear quartz to clam and balance the head. 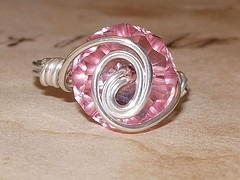 The rose quartz shall balance emotion and the smoky quartz will relive stress and tension. To ease menstruation pains: Laying flat on the floor, place several moonstones around the body. One at the top of the head, one on each shoulder and one on each hip. Moonstone helps to unblock energy restrictions that are exacerbated by emotional and physical tensions often experienced with menstruation. It is also helpful for a woman to carry moonstone about with her, perhaps as a piece of jewellery, when it comes to that time of the month. To heal general aches: Amethyst is a fantastic healing stone that can be used for general aches and pains. Place several amethyst stones of even shapes around the body and lay flat on the floor. For headaches, place amethyst on the forehead. Aches occur when there are energy restrictions or energy imbalances. Amethyst works to unblock those energies and restore balance. Lodestone can also be used in the same way to relieve and revive muscle aches and pains. To refresh mind body and spirit: Laying flat on the floor, take 6 clear quartz points and place them evenly around the body. Place them so the points are facing out. This will calm the body and the mind and release all excess tensions. After several minutes, turn the points inwards to charge the body with energy. All the crystals listed can be found at new age shops and online crystal specialists and the best way to start using these healing crystals is to purchase ones you are drawn to and to start experimenting. With over seven years experience, I have been running the online store Spirit Adventures.co.uk which specializes in new age supplies and Witchcraft & Wiccan items. Orders can be made online at http://www.spiritadventures.co.uk The store is based in Kent (UK). This entry was posted in Crystal Glitz and tagged crystal, crystals, healing, jewelry, swarovski on July 4, 2009 by admin. Having pain problems in your ankles, feet and calves? You may be better off with a magnetic ankle bracelet. Although these anklets are making waves at present, the idea behind their use is really ancient. Magnets were believed to cause ionic checks and balances in the body resulting to improved condition of oxygen and blood flow to nearby cells and tissues. When placing them near your problem areas, you might expect alleviation of pain and other joint anomalies. The idea is to apply a magnetic field to an injured area in order to maintain a normal electromagnetic environment. Since the body has electro-chemicals or ions, the right transfer and exchange of these are essential for optimum health. As an effect, magnets are thought to relax muscles, tissues and capillary walls thereby enhancing oxygen and blood flow to various areas especially the ones closest to the magnets. Most commonly, pain and inflammation problems are said to benefit very much from magnetic field application. According to manufacturers and dealers, the response of individuals will vary depending on the strength of the magnets, duration of application as well as kind and intensity of the physical problem. Some patients report experiencing pain and inflammation relief within a few days while others take several weeks or months. However, it is important to note that magnetic ankle bracelets are not scientifically or medically proven to heal and should not replace medical treatment. The anklets are also sold mainly as fashionable pieces in designated stores and jewelry shops. A number of nations like Germany, Israel and Japan have begun to support magnetic therapy through reimbursement and other benefits. There are no known side effects or contraindications with regards to wearing a magnetic ankle bracelet. Individuals should only watch other jewelry or items they might be using which are magnet-sensitive. There is no solid proof that wearing more magnets will increase the effectiveness or shorten treatment period but there is also no harm done in wearing more. Some people increase the gauss to as much as 30,000 by adding more magnets while others wear 4 to 5 anklets at a time. Since the magnetic ankle bracelets are primarily sold as fashionable pieces, manufacturers ensure that they look very elegant and presentable aside from their supposedly healing actions. There are versions that use magnetic hematite with Czech glass crystals or Swarovski crystals. The anklets may come in the form of wraps, chain links, cuffs and simple attachments. Lengths can be anywhere from 10 to 30 inches long. Charms, beads, gemstones and semi-precious stones may also be added for more appeal not to mention engravings for a more personalized touch. There are magnetized gold, silver, titanium and copper magnetic ankle bracelets too which are great alternatives to the more popular hematite beads. Almost all models are handcrafted to perfectly match the buyer’s specifications and style. The magnets are ideally positioned north to generate more energy. Very strong magnetic power does not necessarily relate to heavier weight. A magnetic ankle bracelet can be anywhere as cheap as $14.99 if made from simple stainless steel. The use of more expensive metals and other details can boost the price up to around $800 to $1,000. Always ask for a warranty and 30-day satisfaction guarantee. Susan Barcelon is a successful Webmaster and publisher of Just-Bracelets.com. She provides more resources on topics such as magnetic ankle bracelet, diabetic bracelet and magnetic necklaces that you can research on her website even while lounging in your living room. This entry was posted in Crystal Glitz and tagged aventurine,, beaded,, bracelet, crystals, sterling, on May 26, 2009 by admin. Will hotfix (hot fix) crystals stick alright to a Nintendo DS using a Kandi Kane? Just wondering if I can use hotfix crystals with a Kandi Kane applicator to stick crystals to a plastic Nintendo DS Lite?? I have differing opinions – some say the glue won’t hold and i would need ot use an extra kind of glue, but some say it should be fine. Any advice? I’ve seen the crystal-encrusted DS lites for sale on websites and want to have a go myself so any tips would be appreciated! Many thanks. The hot fix crystals only stick to fabric well. The heat melts the glue that sinks into the fabric to adhere. For something slick, like a phone or your Nintendo DS, the glue will melt and stick only temporarily. It’s not going to hold onto anything that will be taking some abuse. Use an adhesive like E6000 that is made to hold strong on non-porous surfaces. Have fun!! This entry was posted in Crafting Glitter and tagged beads, crystals, fix, rhinestones, swarovski on April 24, 2009 by admin. When you are planning your wedding day, a good place to start is to choose a theme or decide on a general feeling for the day. There are a lot of decisions to be made and details to consider to plan a day that will be filled with precious memories for you, your groom, your family, and your guests. There are many things that you can do that can create an ambiance of class or simplicity throughout the day without having to go overboard on details. A theme can be pulled off by paying attention to only a few of the events that happen during the day. Choose your favorites, and then put your focus and plan your budget around the “highlights” that are most important to you. This will help you save your money and your mind. It is very easy to get in over your head with all of the things that can, but certainly don’t have to be, involved in planning a wedding. Remember, focus on what is important to you. Today, I am going to focus on simple decorations that you can add to your cake that will really make it stand out in the crowd. After all, people don’t just pay attention to the cake to see whether or not you smash it all over your beloved’s face. I will give you options from understated and elegant, to big and bold. Either way your cake can easily add to your decor and help to make the day complete while keeping you within your budget. 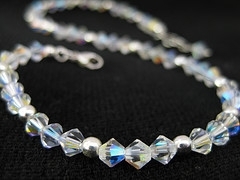 One option that you may decide to utilize is Swarovski Crystal Stems. They are extremely versatile and can be added all over your cake to brighten and add height or pizazz to fresh flowers cake toppers or even monograms. They could also be added to floral designs that may fall down the sides of each layer. The fun thing about Swarovski crystals on stems is that the wires can be bent to mimic any shape. For instance, there is ivy that falls over the top layer of your cake, you can have the stems rise over the flowers that sit on the top and crystals that also cascade over the edges to flow with the ivy dangling down. You may want to have only crystals on stems to create the decorations on their own. This effect would look like you had a firework burst out of the top of your cake and shimmer over the top and down each layer. I have made quite a few cakes with this effect and it is breathtaking! You may also want to have a representation of the two of you coming together with your new initials. You can do this by choosing to have Swarovski Crystal Monograms on the top of your cake. You can have one monogram to signify your last name or you could have three, the Bride’s first initial, the Groom’s first initial, and then the last initial that you now share. These cake toppers can be customized by adding colored Swarovski crystals that compliment your color scheme and fonts can be chosen that are formal or whimsical. These are simple and inexpensive ways to personalize your cake to bring lasting memories to your wedding day. This entry was posted in Crystal Glitz and tagged crystals, earrings,dangling, earrings,sterling, garnet,, gift on March 31, 2009 by admin. Where can I find loose rhinestones in Chicago? I’m making a cake topper and I need pink rhinestones to decorate it. I don’t have time to order it on-line. hobby lobby, wal-mart, fabric and craft stores…..
Hobby Lobby has the best selection of colors and sizes in my opinion. 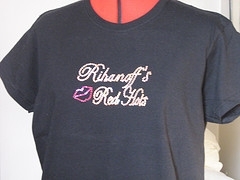 This entry was posted in Rhinestone Glitz and tagged beads, cheap, crystals, etc., rhinestones on March 29, 2009 by admin. what’s the difference between hot fix and none hot fix for rhinestones? Hot fix have the adhesive already on the back. You use a hot fix gun to put it on. They (the gun) are between $15 and $25 bucks. Non-hot fix are just flat back rhinestones where you have to apply a specific glue to each individual stone and apply. The smaller the gauge (the mm) the harder this is to do by hand. also, don’t use crazy glue, unless you have mad skills. If it gets on the crystal, it’s ruined! 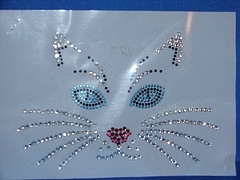 This entry was posted in Crystal Glitz, Rhinestone Glitz and tagged crystals, fix, rhinestones, swarovski on March 27, 2009 by admin. Crystals are the blossoms of the mineralogical portion of the earth; the recognition of the beauty and loving energies of these forms can greatly enhance oneÂ’s personal development. They are the myriad fireworks of both creativity and individual universal energies. Crystals have been used and/or revered since the dawning of civilization. The Christian Bible refers to crystals over 200 times. Recall, the spiritually crystalline city whose walls were made of crystals, whose gates were of pearl, whose streets were of gold dust, whose crystalline light falls upon the crystal sea and crystal river, and where souls that are clear as crystal are jewels forever in the crown of the redeemer. Many of the early civilizations of the Earth (Mayan, Aztec, American Indian, African Native, Celtic) often used quartz crystals in ceremonies and struck the crystals in ceremonies and struck the crystals in order to produce a flash of visible light. Meditating with crystal quartz can be very beneficial in many areas. Below just touches on some of these benefits. All psychic abilities can be stimulated and amplified by the use of this mineral. It further assists one in retaining calmness and clarity in all situations, decreasing the amount of negative affectation, which could inhibit emotional stability. It provides for enhanced energy and promotes perseverance and patience, as well as for restful sleep. Quartz crystals can be used to clear and to activate the energy centers of the body. It attunes well to the heart chakra. Placing the crystal at the area of the third eye, during meditation, seems to enable one to focus more clearly with the mind such that the mind can become empty; this may be attributed to the feeling of Â“onenessÂ” conveyed during the meditation. It further promotes the reflection and magnification of images and thoughts, so that one may evaluate the inner reaches of the self. Placement of the crystal upon the heart chakra, can help to clear emotional disturbances from oneÂ’s being; it also further enhances the states of self-acceptance and self-love. The quartz crystal provides for purification of the physical, mental, and spiritual bodies. It is also a healer of negativity associated with ones perspective and judgment; it can also direct ones materialistic energies toward the spirit realm. It can further enhance ones positive thoughts and feelings toward the light, love, and harmony of the planet. Teaching one to live, laugh and love with all brothers and sisters. If worn close to the neck, it can stimulate the thyroid and parathyroid glands, being also helpful for respiratory problems such as congestion and sore throat. If worn over the heart, it can stimulate the thymus and can increase the efficiency of both the immune system and ones defenses against dis-ease. Whether the crystal is worn, carried or placed in oneÂ’s environment, the force, the warmth, and the brilliance remain attuned to the energy of the one to whom it is connected. Tracey Criswell Wilson is an author on http://www.Writing.Com which is a site for Creative Writers. Many of Tracey’s writings which include, poetry, non-fiction, and fiction can be found on this interactive site. This entry was posted in Crystal Glitz and tagged crystal, crystals, healing, jewelry, quartz on March 24, 2009 by admin. How to get individual iron-on rhinestones to stay in place while ironing? 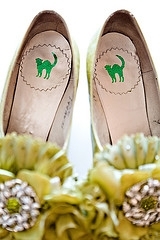 Put them in your desired locations, then very carefully lay a cloth over the rhinestones to keep them in place. Iron the cloth, not the rhinestones directly. 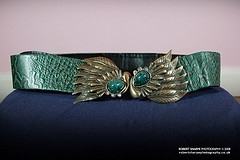 This entry was posted in Rhinestone Glitz and tagged crystals, labels, rhinestone, rhinestones, shopping on March 14, 2009 by admin.